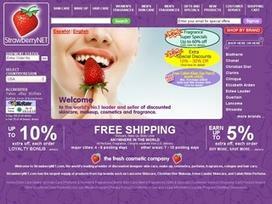 Strawberrynet is a cosmetic company that is known for its range of fresh and innovative products. It offers products at the lowest costs allowing customers to collect different varieties of skincare, make up, and fragrances at affordable rates. Strawberrynet operates in more than 200 countries around the world and has been supplying superior quality cosmetic products for over 10 years. The name Strawberrynet was derived from its similarity to fresh strawberries. Just like fresh fruits, Strawberrynet offers the freshest in cosmetic brands to its customers. The wide assortment of products available at the online store comprise hair care, skin care, make up, and men's and women's colognes and fragrances, along with various gifts and other special items. The store not only stocks a wide array of products from the best brands but also provides added advantages in the form of special offers. The website of Strawberrynet divides its product range into categories consisting of skin care, hair care, make up, perfume and women's fragrances, cologne and men's fragrances, gifts, and specials. Customers can easily browse through these categories and look for everything from cleansers and toners to creams, lotions, and make up items of different types. Orders can also be placed on the basis of brands. Selecting a brand navigates the customer to the product page where all the products from that brand are displayed. Detailed information about the products is given, allowing customers to gauge the price and other features. The new products and special offers are also displayed in separate sections on the website. The orders are processed within 24 hours and are generally shipped within a short period of time with Strawberrynet. Strawberrynet has everything from cleansers, moisturizers, eye liners, lipsticks, and creams to conditioners, shampoos, colognes, fragrances, and other cosmetic products. With the wide assortment of products the online store is equipped to satisfy all kinds of customer demands. It collects products from renowned brands such as Christian Dior, Chanel, Giorgio Armani, Givenchy, H2O, L'Oreal, Clinique, Estee Lauder, and others. Samples are available with some orders, and customers can also make use of the gifts and special items available at the store. Strawberrynet has certain Valentine's Day specials, women's gift sets comprising Christian Dior travel sets including lotions, creams, serums, night creams, and other items. Men's designer colognes from Adidas, Splash, DKNY, Elizabeth Taylor, Armani, Hugo Boss, and others are also available. The newsletter service entitles customers to various exclusive deals and offers. All products purchased from Strawberrynet are genuine and fresh. However, if a customer is unsatisfied, the product can be returned within 14 days. Payments to Strawberrynet can be made with all major credit cards and PayPal. The website assures a safe and secure shopping experience, ensuring privacy of customer information. Share what you think about Strawberrynet, and your favorite ways to save there!